As a young girl, Jeanne White was rocked by a neighbor who softly cried and spoke a strange language. What White remembers most is wetting her finger tips with her tongue and trying to rub away the bluish-black numbers on the neighbor’s arm. “I didn’t know until years later what those numbers meant,” White said as her eyes welled with tears. I pivoted our conversation back to the pocket-sized copies of the U.S. Constitution fanned atop the folding table in front of White and her friend, Sharon Poplawski, hoping to calm emotions so that I could hear the rest of her story. After a few minutes, White resumed and said, when she was older, her mother confided that the neighbor’s children were murdered during the Holocaust. White, a resident of Springville, and Poplawski, who lives in Cedar Rapids, are in “early retirement” and aren’t who people typically envision when they think about activists participating in the Women’s Marches that have twice swept the nation and globe. 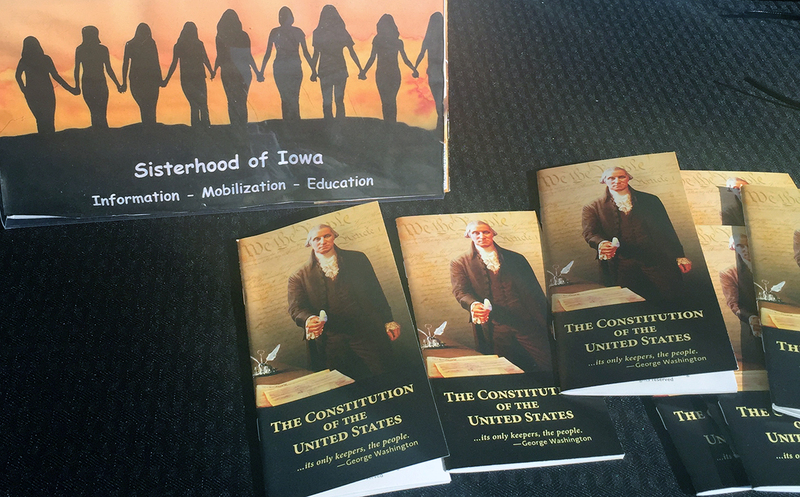 But that’s where I found them Saturday afternoon, sitting in folding chairs near the Iowa Statehouse in Des Moines and passing out free copies of the U.S. Constitution. The women and two friends — Cheryl Hannah and Mary Hubbard, both of Waterloo (also at the March, but not at the table during our conversation) — founded the Sisterhood of Iowa shortly after the inauguration of President Donald Trump. They organized to support each other and the community. When people on Twitter declared NPR’s Independence Day tweets of the Declaration of Independence “fake news” and propaganda, the women pooled their money and purchased copies of the U.S. Constitution. “The Constitution is the backbone of our democracy and republic,” Poplawski said. 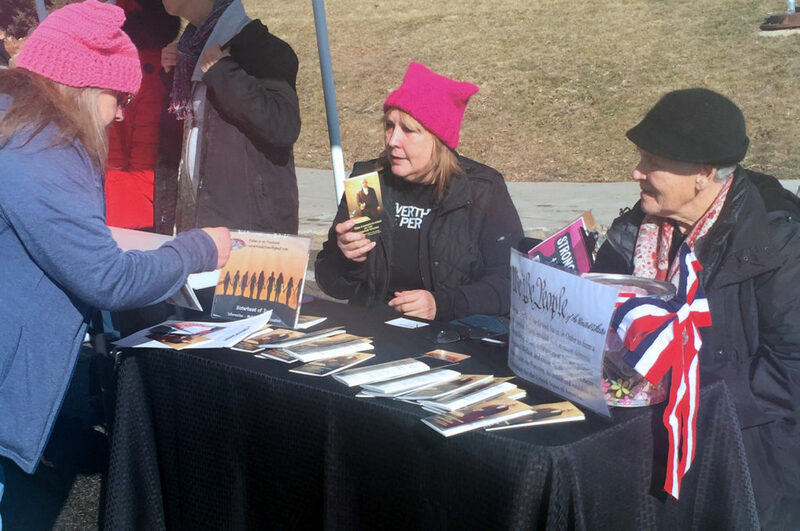 To date, they’ve given away about 1,500 copies — at large gatherings such as the Women’s March, smaller events like farmers markets, and during their daily lives. “I’ve given them to workers at the fast-food drive-through because everyone needs to know their Constitution,” White said. Since Women’s Marches claimed the streets a year ago, barrels of ink have been expended to explain what it means. But all we have to do is look at these four women and the millions more like them. Barriers defining who is and isn’t an activist or organizer are shattered. People of all ages and skin tones are discovering the value of their experience and expertise, and the power of working together. As White knows, no one can rub away the past. Instead, we march. We educate. We stand hand in hand, with all of our collective tools at our disposal, so the past never repeats. This column by Lynda Waddington originally published in The Gazette on Jan. 24, 2018.